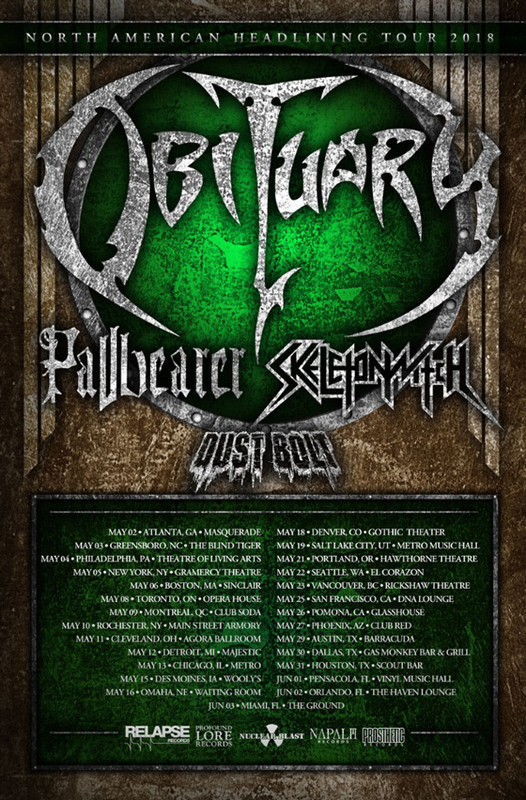 After delivering a self-titled studio album last year, death metal vets Obituary are gearing up to take the album on tour across North America this spring. The group will be joined on tour by Pallbearer, Skeletonwitch and Dust Bolt. The four-band bill will play a total of 27 dates throughout May and June. Canadian dates on the trek include Toronto, Montreal and Vancouver. For Obituary's headlining setlists, the band revealed they're set to "bust out the Big Guns, dig deep into our musical pockets and pull out some oldies but goodies." In a statement, Obituary continued, "With 10 studio albums and over 100 songs in our catalog these days, it's never easy choosing a set list and always causes some serious discussions and arguments amongst the band members, so we are turning to the fans on this one. "We want to hear from YOU what songs we should play and since everyone has their favorites we are really looking forward to hearing what you guys think. This should be fun, entertaining and interesting, so make sure to comment on our social media pages with your top picks." Tickets for all dates go on sale Friday (February 2) at 10 a.m. local time. Find the complete tour itinerary below.